NEW YORK, NY–(Marketwire – Mar 22, 2012) – The Smirnoff Co. has announced that they are offering ‘The Smirnoff “MDNA” Nightlife Edition Remix Album’ to Madonna fans. The surefire collector’s album will be available to consumers exclusively through the Smirnoff US Facebook page. 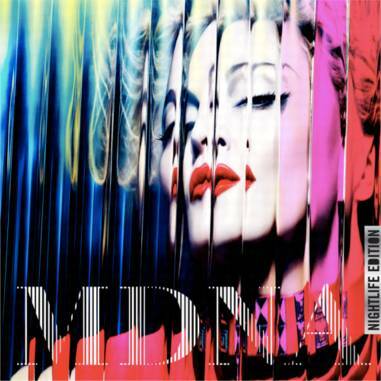 The Smirnoff “MDNA” Nightlife Edition Remix Album features seven remixed tracks from Madonna’s new album, “MDNA.” Both albums are scheduled to be released on March 26th. The “MDNA” Nightlife Edition Remix Album showcases DJ sensations Kid Capri & Just Blaze, from Smirnoff’s Master of the Mix program and never heard before versions of new tracks including “Give Me All Your Luvin'” and “Masterpiece.” This is the latest element of Smirnoff’s multifaceted partnership with Madonna and Live Nation Entertainment. Smirnoff’s exciting offer to fans enables them to purchase the “MDNA” Nightlife Edition Remix Album by ‘liking’ their US Facebook page (facebook.com/SmirnoffUS) and placing their order for $3.50. The simultaneous March 26th distribution of the remixed downloads and the release of “MDNA” on March 26th enables Smirnoff fans to be the first to hear the unique compilation. “We are delighted that Madonna and Live Nation Entertainment’s collaboration with Smirnoff gives us the chance to share extraordinary original content with fans, and provide them with new and exciting ways to experience Madonna’s music,” said Christopher Swope, Senior Vice President, Strategic Alliances & Innovation, Live Nation Network. The Smirnoff “MDNA” Nightlife Edition Remix Album is part of a multi-faceted program between Madonna, her partner Live Nation, and Diageo, the parent company of The Smirnoff Co. The Smirnoff Co. believes in careful consumption and responsible nightlife behavior. Diageo is the world’s leading premium drinks business with an outstanding collection of beverage alcohol brands across spirits, wines, and beer categories. These brands include Johnnie Walker, Guinness, Smirnoff, J&B, Baileys, Cuervo, Tanqueray, Captain Morgan, Crown Royal, Beaulieu Vineyard and Sterling Vineyards wines. Diageo is a global company, trading in more than 180 countries around the world. The company is listed on both the New York Stock Exchange (DEO) and the London Stock Exchange (DGE). For more information about Diageo, its people, brands, and performance, visit us at Diageo.com. Visit www.drinkaware.com and Diageo’s own global resource www.DRINKiQ.com for information and guidance on responsible drinking. In Great Britain, Diageo is a member of The Portman Group and supports The Drinkaware Trust.Celebrating life, every day, everywhere.